Not your standard Manufactured home. Custom-Newly Remodeled in 2013 with the Southwest feel. 2”x 6” walls with extra insulation and stucco outside walls (low utilities), and block retaining wall around entire foundation. 1296 SQFT Garage with 8 car bays, 12” concrete floor and 20′ x 20′ shop/storage, plus Carport that can be used for horse shade. Nice Kitchen with pantry, breakfast bar and Oak Cabinets. Full length front porch added in 2017. Fenced backyard, Native landscape front, Australian trees, fruit trees, grape vines & bushes providing privacy with an Italian Garden feel. 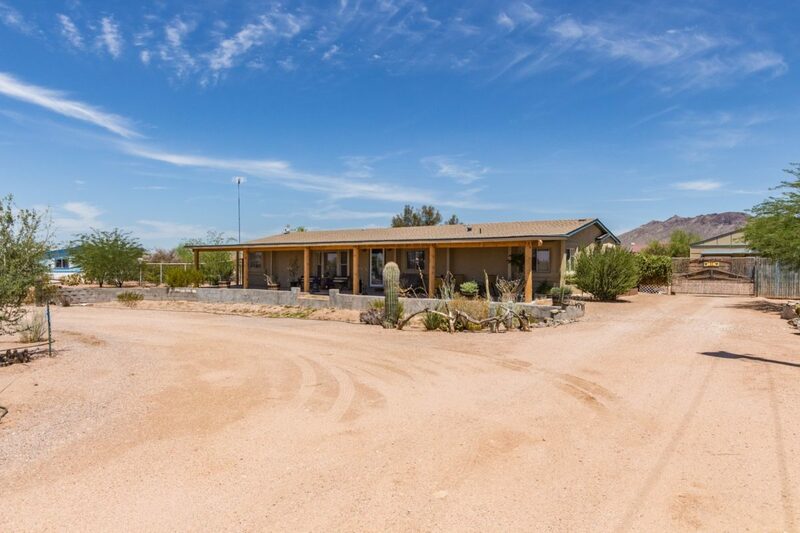 Sits on 1.25 Acres of horse property with a ”No Climb” horse fencing, no wasted land here! Great view of Gold Field Mountains and Superstition Mountains and many more! Must see to truly appreciate!